The Iona Group, Inc. is proud to announce the relaunch of the English language version of Martin Engineering powered by Drupal 5.x. 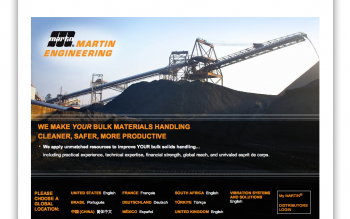 Martin Engineering is the leading global supplier of systems to make the handling of bulk materials cleaner, safer, and more productive. Since its founding in 1944, the company has grown dramatically through the development of solutions to help the solids-handling industries around the world. Martin’s website receives around 1000 unique visits every day and is used both as a resource for employees as well as a selling tool and knowledge repository for potential and current customers. The aim of this year and a half project was to restructure Martin’s information architecture, introduce new categories for another metaphor for finding Martin’s products, breathe new life into the site’s design to make it more attractive to visitors and move away from a home-grown CMS into a more robust and solid platform. Improvements to site wide administration were paramount; Site administrators wanted full control to change any part of the site from the administration back-end, without having to use FTP or edit any compiled (Flash) code. Moreover, Martin uses their corporate website as a document library for tech data sheets, operator manuals, and all other sorts of product-related print material – around 700 PDFs altogether. Further, these documents needed to be able, but not required, to be associated to other content on the site. Brian McMurray (bmcmurray) was the main developer for this project with support from Steven Merrill. Read the full case study at drupal.org.